After a conversion to Islam, Faheem Nichols began selling oils and scents from his minivan parked on the corner of Eastern and Sherman. Now, 20 years later, what began as Nichols' side business has become West Michigan's first oils and fragrance café. Lining the peach and black walls of Smell Goods Café colors chosen after the Prince and Sheena Easton song, “U Got the Look,” are hundreds of multi-colored crystal bottles filled with fragrances from all over the world. Every fragrance is oil based and has been carefully chosen by Faheem Nichols, whose business motto is, “If you smell good, you feel good.” Nichols traces his business idea to his conversion to Islam -- a conversion nothing short of extraordinary. While in housing community in Saginaw, Michigan, Nichols overheard the name of God, “Allah,” spoken by his friend, Grant Perkins, who happened to be free styling some of his own hip-hop lyrics. “The moment I heard the word “Allah,” I knew God had taken the veil off my heart, and I understood. 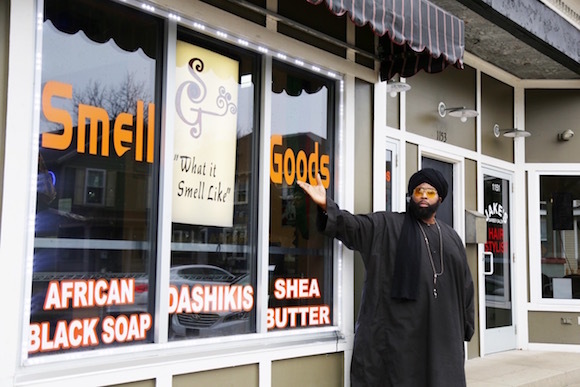 So hip-hop happened, and hip-hop led me to Islam, and Islam led me to oils,” Nichols says, recalling how he came to be the business owner of Smell Goods Café, the first oils and fragrance café in West Michigan. Nichols, who resides just around the corner of his shop, located at 1155 Madison Ave., shares he first got started selling oils and fragrances after a trip to India 20 years ago. After returning to the United States on a warm summer afternoon in 1997, Nichols was taking a walk through his neighborhood in Madison Square when he was approached by a friend who asked him, “What’s that smell you got on?” “I told him I had brought back with me these oils from India, and he wanted to buy one,” explains Nichols. That interaction turned into a business deal, and Nichols ended up selling his friend one of the bottles for $10. By the end of that day, Nichols had made $100 after he sold all 10 bottles. As a man of faith, Nichols wanted to seek direction from Allah, so he took his money and went to pray at his local mosque on Burton Street, The Islamic Center. At the mosque, Nichols met up with a friend who had recently arrived to Grand Rapids from Chicago and was heading to Detroit. Nichols gave his friend $100 to buy him more oils. Success for Nichols was not instantaneous; when he first got started, the entrepreneur sold his oils and fragrances out of a small tent on the corner of Eastern Avenue and Sherman Street. “I was there five days a week, and I would sell people of the neighborhood oils, incense, shea butter and black soap,” he says. At the time, Nichols, who was also working as a care provider at the Kent County Juvenile Detention Center, started selling his oils to his co-workers and considered his business a side hustle. Eventually, his side hustle allowed him to save up enough money to open up his own restaurant, Abba’s Fish & Grill at 1324 Burton Street. At the restaurant, Nichols would continue selling his oils, but his main focus was the food. “I never not once stopped selling oils and incense no matter what job I worked,” Nichols says. After a couple of months of being open, Nichols was forced to close Abba’s Fish & Grill, as he was unable to keep up financially. “So I let that job go, and I went to the mosque and asked Allah for assistance. I asked him to guide me to my next move,” says Nichols. This prayer led Nichols to setting up his tent outside of Oj’s Beauty Enterprises, near Duthler’s Family Foods on Madison Avenue, from where he would sell his oils. Because Nichols had been selling oils for years, his customers followed him from Eastern and Sherman to the corner of Hall and Madison. It was across from Oj’s Beauty Enterprises, that Nichols would meet Charlie Park, the owner of the salon, and learn about what owning a business entails. “Every afternoon I would sit with Charlie while he smoked his cigarette, and I would ask him questions about his business and he began teaching me,” says Nichols. Five years later in 2012, after countless hours spent attaining knowledge from Park, Nichols was ready to rent a space to open his own shop. “Dave Allen, the owner of my building, took a chance on me and started my rent at $400,” says Nichols. In other words, Allen, also a Third Ward City Commissioner, made a deal with Nichols to increase the rent to market rate slowly depending on the success of the business. This was five years ago, and Nichols’ business now features more than 1,000 different fragrances and a café where customers can create their own unique fragrances. 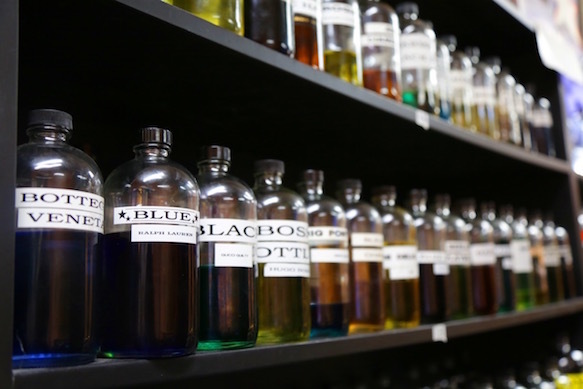 Scrolling through the store’s customer database on the store's iPad, one can get a glimpse at the hundreds of unique scents made by Nichols’ customers. Each fragrance is exclusive to the customer who concocted it and is not sold to anyone else. Every customer who comes in has the opportunity to sample every fragrance and create their own. Nichols hopes the success of his business can be a hope for others who have similar entrepreneurship dreams. “I would like to see more small businesses open, and for people to have the opportunity to learn how to run a business well,” shares Nichols. There are 310 distinct businesses that occupy the boundaries of Wealthy Street, Cottage Grove, U.S. 131 and Madison Square, according to data obtained from the Dorothy A. Johnson Center for Philanthropy at Grand Valley State University. In addition, within these boundaries 51.7 percent of housing is renter occupied, and, Nichols stresses, many of these residents are having difficulty making their rental payments. “Many of my customers who used to live in the area have now moved to Kentwood,” he says. As Smell Goods Café grows, Nichols hopes he can eventually purchase his own space and be able to expand to Kentwood and Wyoming. Until then, he spends his days helping those come to his shop smell good and feel good. Smell Good’s Café is open Monday through Friday 10am-7pm, and Saturdays from 10am-5pm. The shop is closed on Friday from 1:30pm-2:30pm, for Jummah prayer. The shop is located on 1155 Madison Ave. SE, Grand Rapids, Michigan.